Retinal detachment is a separation of the light-sensitive tissue in the back of the eye from its supporting layers. A detached retina is a serious medical emergency that can lead to permanent loss of vision and possibly blindness if left untreated. 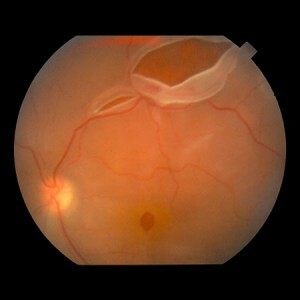 Typically, retinal detachment results from a tearing of the retina. This may also cause bleeding of blood vessels inside the eye, which can leak into the normally clear vitreous gel, and severely impair vision. The macula, the small area of the retina responsible for our fine central vision, may also become detached, in which case complete loss of clear vision may occur. If you experience any of the symptoms described above, it is essential that you contact one of our doctors at Retina Macula Specialists of Miami to arrange an urgent consultation. Vitrectomy involves the surgical extraction of the clear gel in the back of the eye, called the vitreous, which is then replaced with air, special gas, or silicone oil to help hold the retina in place until it reattaches itself. Postoperative positioning (e.g. face down) is typically required to facilitate reattachment of the retina. Scleral buckling involves the use of a silicone band that is placed around the eye. The band moves the wall of the eye closer to the detached retina, thereby helping the retina reattach. Both vitrectomy and scleral buckling are performed in the operating room as an outpatient surgical procedure. Pneumatic retinopexy is performed in the office setting (as opposed to the operating room) and involves sealing the causative retinal tear with cryotherapy or laser photocoagulation and injecting a special gas to reattach the retina. This procedure is typically reserved for retinal detachments limited to one causative break in the top portion of the retina.